One of Kolkata's most unusual sites, this palace was built by a local member of the 19th century gentry in a marvellous patchwork of classical architectural styles. Lavish use is made of Italian marble, and the lawns contain an eclectic pantheon of statues including Christopher Columbus and the Buddha. 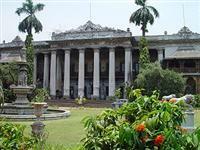 The Marble Palace is a place of drama and dilapidation - and unsurprisingly, has frequently been used as a movie set. It remains a private residence, however, so you'll have to arrange a permit to view the interior (a worthwhile activity, if only to gawk at the impressive art lining the walls). Permits can be obtained from the West Bengal Tourism Information Bureau. With a permit, entrance to the palace is free and a member of the staff will show visitors around and tell them about the place. Frequently, those who arrive without the permit are persuaded by the guards to pay bribes to get in but this is not advisable as one bribe may quickly lead to another a few steps later! Next to the palace is the Marble Palace Zoo, the first zoo opened in India, which is now primarily an aviary, housing peacocks, hornbills, pelicans, storks and cranes. No photography is permitted in the palace.